USMC Colossal Blackout Stiletto - Large Assisted Opening Pocket Knife - Officially Licensed | BUDK.com - Knives & Swords At The Lowest Prices! An undeniably modern take on a classic folding knife design, the officially licensed USMC "Blackout" Stiletto combines all the wicked ferocity of the iconic stiletto with contemporary tactical appointments and styling. And this impressively supersized "Colossal" version packs even more punch than the original USMC Blackout Combat Stiletto, with its menacingly enlarged blade and beefed up overall dimensions! Its potent 5" 420 stainless steel blade features the sleek spear point profile that old-school stiletto fans know and love and adds a distinctive blood groove and bold nonreflective black coating. 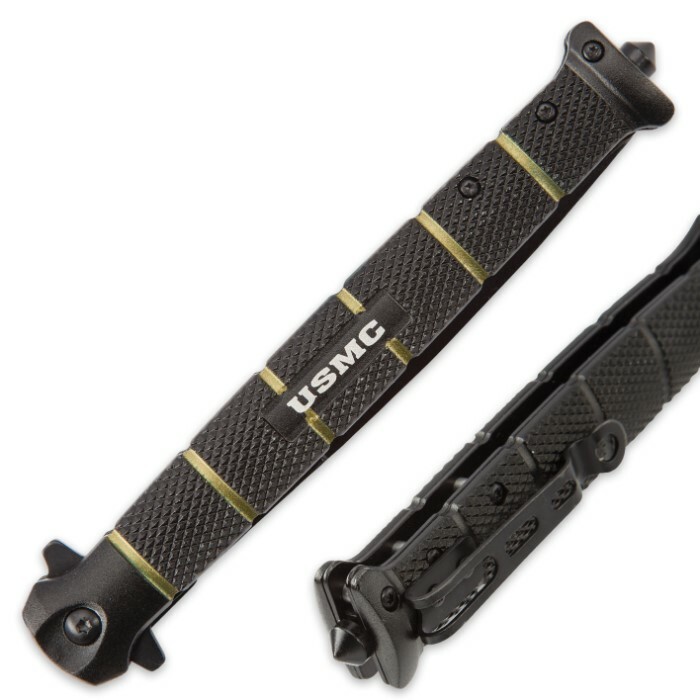 Beautifully offsetting the blade's matte black finish, the famous USMC seal is carefully laser etched in white next to the razor sharp edge, flanked by the branch's illustrious, well-earned slogan - "Marines: The Few. The Proud." The chic blade deploys with incredible speed, thanks to the Colossal Blackout Stiletto's silky smooth assisted opening mechanism - easily triggered with the handy flipper. Cast from an advanced aluminum alloy, the handle is encircled by five green bands - an aesthetic nod to the historic USMC combat fighter knife and its legendary stacked leather handle. 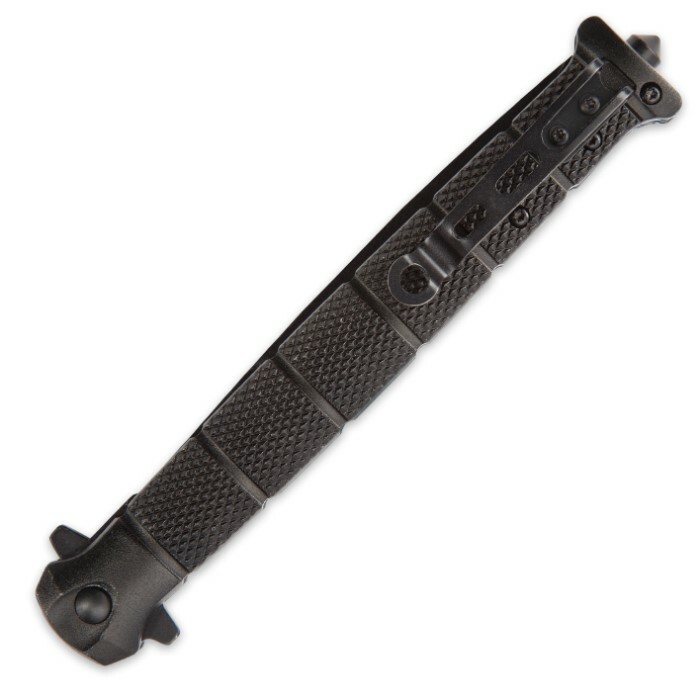 Engineered to satisfy the unique tactical demands and survival challenges of the modern era, the Colossal Blackout Stiletto's handle is extraordinarily durable yet lightweight, boasting an elegant diamond gun stock texture that virtually eliminates slippage, even in wet, muddy environments and other harsh conditions. "USMC" is laser etched at the handle's center, reminding all who see it that the Colossal Blackout Stiletto is built "Marine tough." Set at the base of the handle is a convenient steel glass breaker - another contemporary feature that's perfect for escaping (or assisting others in escaping) entrapment in a wrecked vehicle or burning building, where glass windows are the only means of exit. Add the built-in steel pocket clip, and you've got an outstanding, extra-large assisted opening folder that honors traditional wisdom, while taking full advantage of the latest and greatest innovations. 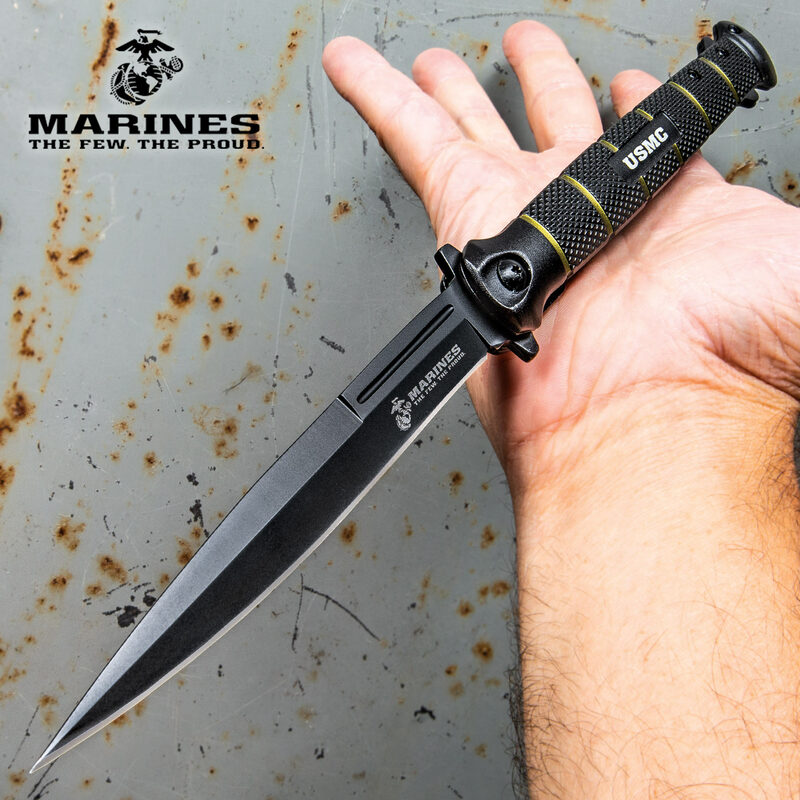 And since it's officially licensed by the United States Marine Corps, you can rest assured the USMC Colossal Blackout Stiletto is in it for the long haul - a stout pocket knife you can rely on, come what may, just like a US Marine. I really like this knife. It fully deploys without any hangups. Very sharp right out of the box. I especially like the glass breaker feature at the end of the handle. Carry it the glove of my vehicle just in case. I highly recommend this knife! Much like someone else, I'm finding the knife hard to open without some extra help (pulling it open), but the blade is VERY sharp. I'm happy with it. This is my current edc, clipped to the outside of my pocket. It deploys smoothly unlocks perfectly. I have worked this knife many times, kind of like a nervous tick. Never had anything unexpected happen. I am very confident that it will function properly if it ever comes to crunch time. It is hard to open and when it loosens up it is hard to close. I cut my hand (nothing serious but still a little nasty cut) trying to close it because it was stuck. The easiest, best and safest assisted opening knives are ones with a thumb stud on the knife blade not the ones like this knife where you have to use your index finger on top of the handle of the knife. Cheap knives are hit and miss sometimes you get lucky and sometimes you don't. I don't recommend this knife. The handle has a good spring and the blade locks up tight .However, the blade will jam open on you quite frequently and the handle is just a little to narrow for sure handed operations. That said, it's a good knife for show in a collection but not good for EDC.